The Doug Thompson Agency, a family owned insurance and financial planning firm that provides coverage to business and residential clients throughout southern Texas, is joining the nationally recognized Ronald McDonald House organization in a charity event aimed at assisting the families of children receiving care in local hospitals. 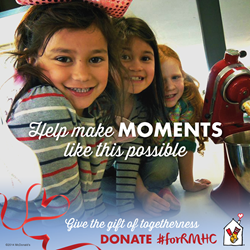 The Ronald McDonald House organization operates a large network of temporary housing facilities that are provided to parents of children who are receiving critical care in a nearby medical institution. By allowing parents and children to remain close to one another, Ronald McDonald House research shows that the recovery process is improved and healing takes place at an accelerated rate. “We all understand the importance of family – the Ronald McDonald House works to keep families close together during difficult times, and this charity event will help ensure they continue their mission,” says Doug Thompson, founder and director of the Doug Thompson Agency. Thompson and his team are actively generating support for the charity event by reaching out to local families and business owners over social media and email. The Doug Thompson Agency will also be writing up a feature article discussing the Ronald McDonald House charity drive in the next release of “Our Hometown,” a monthly online digest hosted by the firm: http://www.dougthompsonagency.com/Our-Hometown-Magazine_39. The Doug Thompson Agency is a recent entrant into the nationwide “Agents of Change” charity involvement movement. As part of this ongoing campaign, the Thompson team will be choosing and supporting another new Texas-based charity or nonprofit every other month. Readers who wish to take part in the Ronald McDonald House charity event along with the Doug Thompson team can pledge to make a contribution to the cause from this page: http://www.dougthompsonagency.com/Providing-our-Patients-Families-a-Home-Full-of-Hope_13_community_cause. Readers who wish to stay informed on future charities assisted by the Doug Thompson Agency team can track the firm’s Community Causes roster here: http://www.dougthompsonagency.com/community-cause. As a Personal Finance Representative in Harlingen, agency owner Doug Thompson knows many local families. His knowledge and understanding of the people in his community ensures that clients of the Doug Thompson Agency are provided with an outstanding level of service. Doug and his team look forward to helping families protect the things that are most important - family, home, car and more. The Doug Thompson Agency also offers clients a preparation strategy for achieving their financial goals. To contact an expert at the Doug Thompson Agency, visit http://www.dougthompsonagency.com/ or call (888) 856-2020.